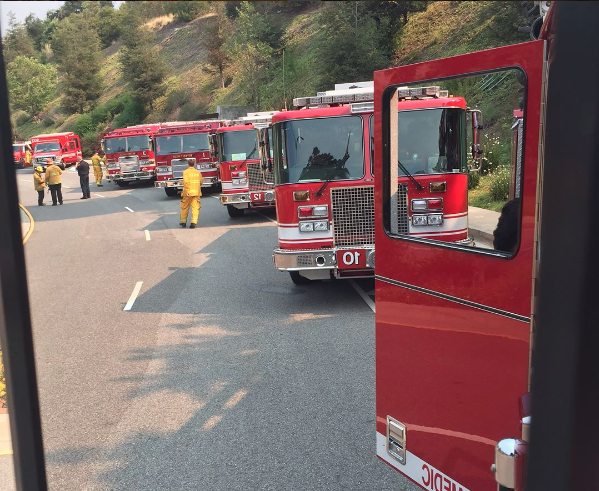 A 55-acre brush fire in Mandeville Canyon in Brentwood was 95 percent contained by Monday, May 29. BRENTWOOD—A brush fire that spread over 55 acres and burned within 200 feet of homes in Mandeville Canyon in Brentwood was 95 percent contained by Monday, May 29. According to the Los Angeles Fire Department (LAFD), the fire was reported on Sunday, May 28, at about 12:46 p.m., in the 2960 block of Mandeville Canyon Road, which follows a deep canyon and ends near a curve of Mulholland Drive. Authorities confirmed the blaze was accidentally caused by sparks from an overheated brush-clearing machine. By the time it was reported, the fire burned three or four acres of brush adjacent to a home. Over 150 firefighters arrived at the scene. By 2 p.m., the fire spread over eight acres, toward the Mountaingate Country Club, north of the fire and west of the San Diego (405) Freeway. By 4 p.m., authorities estimated the fire had charred over 30 acres uphill. At about 10:40 p.m., it had reached 55 acres, in winds of about five to ten miles per hour. According to Margaret Stewart of the Los Angeles Fire Department, about 70 percent of the flames were contained by this time with the aid of a containment line of cleared bush. A plume could be seen from the nearby Getty Center and across the Westside and San Fernando Valley. Fire trucks were appointed at the Mountaingate Country Club and down Sunset Boulevard, two miles from the fire. Water-dropping helicopters arrived to help control the flames. Firefighters worked through “rugged, steep and largely inaccessible terrain” equipped with chain saws and hand tools, according to LAFD spokesperson Brian Humphrey. Five houses were evacuated. Residents were allowed to return to their homes on Sunday evening. No structures were damaged, and no injuries were reported. According to a statement released by the LAFD on Tuesday, May 30, new crews of firefighters replaced those who worked throughout the night. The LAFD expects to reach 100 percent containment of the fire by Tuesday evening.